It is an honor to serve as principal of St. Genevieve High School. In getting to know us, you will frequently hear the term, VALIANT SPIRIT! It is truly this spirit that makes us unique. The SPIRIT of us VALIANTS is one which supports each other, encourages each other, challenges each other, and most importantly, it is a spirit that allows us to love one another. The bottom line is, there is a lot of love on this Valiant campus. Do we all get along all of time? Of course not. Do students make the right choices all of the time? You already know the answer to that one. What makes us special is that we make attempts to get along all of the time as well as to always make the right choices. Our students are encouraged to embrace the qualities that make them unique, to respect the differences in others. We work hard at creating an environment where ALL ARE WELCOME, where ALL ARE RESPECTED, and where ALL SHOW RESPECT. We are trying to prepare our students to be leaders in a turbulent world by providing a high school experience where it is cool to love and be loved. Thank you for your interest in St. Genevieve High School. 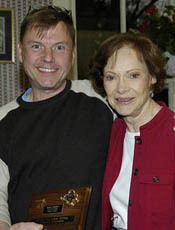 President-Principal Daniel Horn receiving the "Key to the City" from the people of Plains, GA.
To his left is one of Plains more notable citizens, former First Lady Rosalynn Carter.